We have become more and more excited about our prospects of making great wine from the Weitz Vineyard and the 2014 vintage is showing exceptionally well. In the glass the wine is translucent purple and opens with signature scents of red and black berry fruits, cassis and crushed petals. 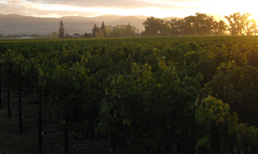 Notably plush tannins and natural acidity are coupled with a distinct minerality from the volcanic soils. Considerable depth and fruit will continue to develop as the structure starts to integrate with bottle age and bring tremendous purity and allure. Decanting a few hours will benefit this wine for early drinking; cellar for 5-10 years to enjoy this wine in its prime. "Lots of terracotta and red soil highlight the red berries and plums. 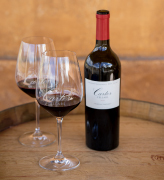 Full-bodied yet very poised with a dusty tannin texture that gives length and energy. Classic, traditional style. Drink in 2019." 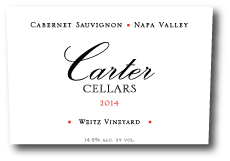 The Carter Cellars 2014 Weitz ' Cabernet has sold out, but other Carter wines are available.